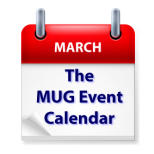 The hot place on this week’s MUG Event Calendar is Texas, where Dave Hamilton of The Mac Observer and Mac Geek Gab will visit one group, and Take Control author and TidBITS Managing Editor Josh Centers will address another. Social media will be covered in New Jersey and home automation is on the agenda for a Florida group. Naples MacFriends – Home Automation Run Amok! South Suburban Macintosh Users Group – What kind of company is Apple?